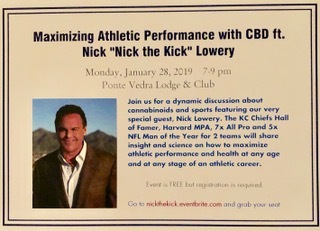 On Monday, Jan 28 from 7 to 9 PM at the Ponte Vedra Lodge & Club, former NFL pro, Nick “The Kick” Lowery, will give a presentation on brain health, CBD and improving athletic health at any age or level. Here’s a clip of Lowery speaking about CBD, as well as his Super Bowl predictions. If you haven’t heard of CBD, you may not know what Instagram is either. Here’s your opportunity to learn the science and benefits behind the former from a passionate advocate, and, well, you can ask your teenage daughter about the latter. The event is free, family-friendly and open to all, however, registration is required.